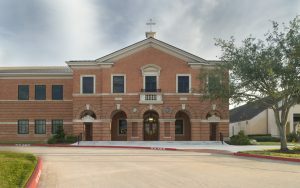 The first Catholic congregation in the Sugar Land area was recorded in 1915. To attend Mass, local residents traveled by train every fifth Sunday to the home of the Jessie H. Roberts family on Main Street. Father I. P. Tonson of the Oblate Fathers of Mary Immaculate (O.M.I.) from Houston came to provide sacramental and pastoral care on these occasions. In 1920, the Sugar Land community formally became part of the Oblate missions and was attached to Immaculate Conception church in Houston. In 1960 a new church building was dedicated at the corner of Main and Seventh Streets. The land was donated by the Imperial Sugar Company. Construction of the convent for the Sisters of the Missionary Catechists of Divine Providence (M.C.D.P.) was completed two years later. These Sisters served the church from the 1920’s until 1990. In 1966 the first Parish Council (now called the Pastoral Council) was created. In 1967 the construction of a rectory, parish hall, and classrooms was completed. 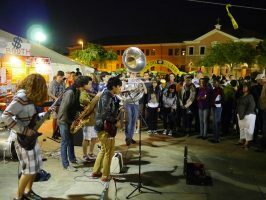 In 1970 the annual May Bazaar was established. In 1975 the church recorded 600 parish families and 450 children in the Continuing Christian Education (CCE) program. In 1982 the church was transformed into a chapel, becoming the transept of a new, larger church building. A bell tower was also constructed. In 1990 the M.C.D.P. sisters were reassigned and the convent was converted into a Perpetual Adoration chapel with support rooms for CCE. In 1996, the church recorded 2800 parish families and 1500 children in its CCE program. Also, two new buildings to house the Parish Hall and more classrooms were added. Existing facilities such as the youth and adult education centers were remodeled, the nursery and St. Vincent de Paul food pantry were expanded, and a music room was added. In 1999 the church was remodeled, expanding the seating capacity to 1,200 people. The number of active families reached 3,574. In 2001 the Basilians Fathers left the parish after 46 years of service to the community. On August 25, 2001 a tribute to the service of the Basilian Fathers was celebrated by the Most Reverend Joseph Fiorenza, the Bishop at the time. The Diocese of Galveston Houston assigned Father Stephen B. Reynolds to be its first diocesan Pastor. On August 26, 2001 the ground-breaking ceremony for the Family Life Center took place and it was completed not long after. 2008 brought about a new chapter in the church’s history, with the opening of Saint Theresa Catholic School, dedicated to Catholic, Classical Education. A new Education Building designed by Duncan Stroik Architect, LLC, was completed the following year and was solemnly dedicated by the Archbishop, His Eminence, Daniel Cardinal DiNardo on August 13, 2009. The structure houses the school and parish offices and is utilized for CCE in the evenings. After almost 15 years of dedicated service, Father Reynolds was reassigned to another parish in the [now Arch]diocese in 2015. Upon his departure, the community asked that the Education Building be named in his honor. The parish is currently comprised of more than 4,800 households.